We have been manufacturing Flange Type Cable Gland for a long time and have marked our prominence in it. We manufacture Flange Type Cable Gland from bars castings with brass finish, which comprise of brass body, plate clamped with galvanized mild steel studs and nuts. 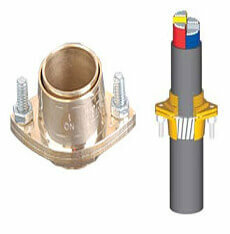 Application :Generally for Armoured Cable and Outerdoor use. * Any dimensional changes are purely the result of our endevaour to constantly improve the efficiency of the product. Jamnagar - 361004, Gujarat, India. Copyright © 2019 Globex. All Rights Reserved. Designed and Developed by megabytes e-Park Ltd.